Many professional wrestling fans consider the Road Warriors one of the, if not the, best tag teams ever. The Road Warriors: Danger, Death, and the Rush of Wrestling gives an inside look into the spike and war-paint clad brawlers. Since he’s the author, the book mostly focuses on Joe Laurinaitis life in Minnesota and how he and a friend of his named Michael Hegstrand changed their names to Animal and Hawk respectively and became professional wrestling royalty. One of the things you take away from this book is how there was such a close-knit group of wrestlers from Minnesota who grew up together, worked out together and even bounced at the same nightclubs together. Animal and Hawk came into the wrestling business alongside Rick Rude, Demolition Smash, Nikita Koloff and even Curt Hennig, all of whom they had known since they were teenagers. Animal also goes out of his way to mention how Koloff is his best world, and makes me wonder how different the Road Warriors would have been if Koloff was part of the team instead of Hawk. 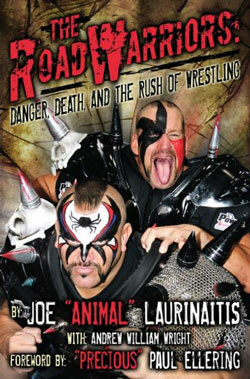 Once the Road Warriors made a name for themselves, the book goes on to explain their wrestling career and world traveling, taking them to Japan and to the World Wrestling Federation and every other major promotion in between. I was surprised to see how important their on-screen manager Paul Ellering was to their development as performers and helping them as a business adviser. You get the sense that he was equally responsible for their success. Unfortunately for the Road Warriors, their biggest enemy was Hawk himself. As their years went by, he became increasingly difficult to work with and made poor professional choices that hindered their growth. And his reputation for partying hard certainly had a negative impact on both of their careers. It’s interesting that at certain points in the book Animal pretty much blames some of their problems on Hawk’s behavior, but takes responsibility himself for what happened, as he was supposed to be the level-headed one of the group. Things started looking up for the Road Warriors in the early 2000s, with Hawk getting his personal problems under control and them getting ready to make a comeback. Unfortunately, Hawk died of a heart attack in 2003 and ending the Road Warriors career. Wrestling career aside, you really get a sense of what makes Animal tick. He’s a devout Christian and his family is the most important part of his life, equal if not greater than his in-ring career. Animal comes across as a great guy who lived out his dream. He also makes a point that personal problems aside, Hawk was a very good friend of his and he is glad that they shared such a successful career. While not accessible to non-wrestling fans as Mick Foley and Chris Jericho’s first books or as super detailed as Bret Hart’s, The Road Warriors: Danger, Death, and the Rush of Wrestling is an enjoyable read for die-hard Legion of Doom fans or casual wrestling watchers.